In an UPCOMING area this STUNNING newly refurbished 3 bed home, villa has 2.5 bathrooms. Sleeps up to 8 people. 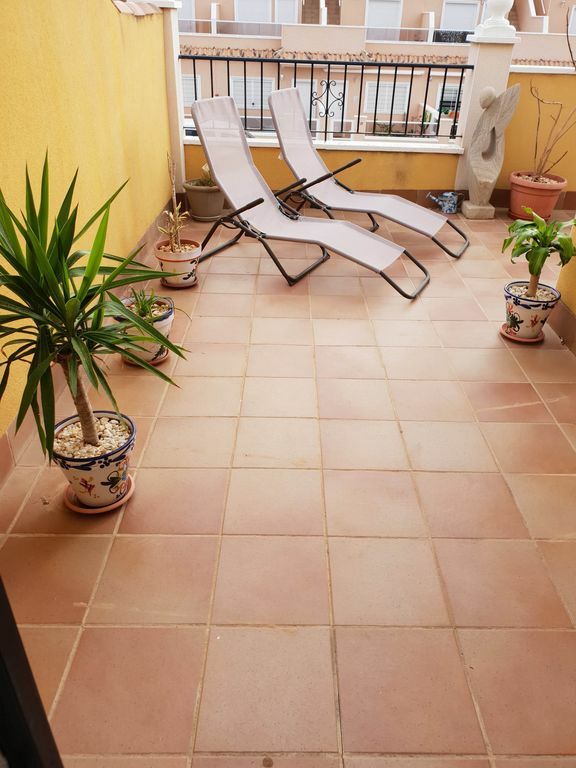 Upstairs has a large terrace with plants, furniture from 2 double bedrooms. 1 full bathroom. Downstairs has a further double bedroom with 1 full shower room. New fully equipped separate kitchen. Outside covered utility area with shower, washing machine & shed. Spacious lounge/diner with fireplace. Hot/cold air-con. Secure landscaped front garden with furniture and barbecue. Chairs to take to pool area. Car parking outside of house. Alarmed. Communal gated gardens with 2 x pools, jacuzzi and children's play area, relaxing area. 30 mins walk to lively strip with bars, shops and restaurants. 40 mins walk to palm lined promenades, blue flag beaches and marina. 10-15 mins drive to 3 famous golf courses. Campaomor, Villa Martin and Las Ramblas. 5 mins walk to local bars, shops, restaurants, mini golf/bar. New shopping/restaurant complex opening soon. Fashion Warehouse also opening soon. Other supermarkets & the new La Zenia boulevard approx 10 min drive, 20 mins drive to Torrevieja with its aqua park famous salt lakes and flamingos. 30 mins drive to the up market Mar Menor. Fiestas, markets are also local. 50 mins drive from the NEW Murcia International airport, 50 mins drive from Alicante. A cleaning charge FROM 60 EURO (DEPENDANT ON PARTY SIZE) is chargeable when handing back the keys to key holder. This property is a 'home' - Strict - Please keep house, kitchen appliances & barb e que clean & tidy..You will lose your deposit! Thank you..
My husband and I are in our 60's. We live in the Midlands in the UK. We have no children but love to help rescue dogs in the UK & Spain. I work full time, my husband is now retired. I look after my mother who is in her 80's and had a kidney transplant 28 years ago so I do a lot for this charity and for cancer as I lost my dad and mother-in- law to this disease. We have travelled a lot over the years but Cabo Roig Spain has everything that we look for in a holiday and eventually hopefully retirement. The house is in a quiet & relaxing area but a 5 minute or a 30 min walk or 5 minute drive & you can have all the bustle you want! Full upstairs bathroom includes bath with hand shower, shower screen, wc, bidet, sink, large mirror, shaver socket, hair dryer, tongs, shelves, dressing gown, slippers, bath cosmetics, toilet rolls, Full downstairs shower room with walk-in shower, wc, large mirror, cabinet with draw's & toilet rolls. Outside utility area has shower. The spacious living/dining room has 6 chairs & table, 3 small tables, 2 armchairs, 2 single sofa beds, colour TV, DVD player & films, WiFi, Hi Fi system, board games, books, fireplace and intercom. 3 top golf courses, Campoamor is a 5 minute drive away while Villa Martin and Las Ramblas are within a short drive. Approx 10-15 mins. All with 4* and 5* hotels on site and club house for anyone to visit, watch, relax and have a meal and drink. Many more close by to try. Golf shops are also close. Wheelchair accessible small step up into garden. There is a downstairs bedroom with 2 single beds, wardrobes, a seperate walk in shower room with toilet, sink, large mirror and shaver socket all leading into the lounge and kitchen area. Also the utility area has an extra shower. The gate leads to the front garden. The area is flat. The sun is on the front of the house from early morning until around 7.00pm in the evening. Notes on accommodation: Main rooms have ceiling fans and hot/cold air-con. Board games are for use. For hire are high chair, cot, golf clubs and fishing rods. Excessive use of air-conditioning (when out of the property) will result in the non-return of the deposit also breakages or loss of keys. Smoking allowed outside only. Sorry no pets or groups under 24s. Children welcome, the elderly and disabled are welcome. Tourist information and comment book are in house for your feedback. The house & contents are new. The sun is on the front of the house all day so breakfast can be eaten outside from the bedrooms on the terrace or in the garden then you can rest or sunbath all day.. The house is bright, modern, relaxing & comfortable. In the evening soft lights can be turned on for your evening drink of Sangria, again in the garden or on the terrace where there is no need to run up & down stairs as there is a wine cooler waiting to chill those drinks. Outside: The front gate has an intercom. The gardens are landscaped with herbs, orange and lemon trees and flowers. The patio area has barbecue, table, chairs, parasol and sun loungers. Outside lights. On the large upstairs terrace this has bistro table, chairs, parasol, sun loungers and wine cooler. The sun is on the front of the house from early morning until around 7.00pm in the evening. The secure gated communal pools one deep & one shallow for children with waterfall (not heated) & bridge with jacuzzi and children's play area are set in beautiful landscaped lawned gardens with trees, flowers & exotic plants also has a separate built shower room and toilets. This is a relaxing area and never crowded. On the road car parking outside the house. A short walk are the bars shops and restaurants called La Ronda square. Utility Room: The newly covered utility area has the water heater, washing machine, clothes line, it has the 3rd shower. A small shed. The door and grilled gate leads to the side garden, a few items for the beach and pool are also provided plus children's toys for beach. Cleaning / Towels / Linen / Maid service: Towels and bed linen are provided also a cleaning charge FROM 60 EURO is payable at end of holiday on collection of keys. Extra cleaning is advised weekly at a small charge for 2 week or more stays. Quotes given. Welcome packs & also Taxi service and Car hire. Met 3 slaapkamers en 2 badkamers is dit huis ideaal voor families met kinderen. Het zwembad zit om de hoek , stoelen moet je meenemen vanaf het huis. De keuken is van alles voorzien , tevens is er wasmachine. In de buurt van het huis zit een Aldi en restaurants op loopafstand. Voor andere winkels, restaurants en het strand heeft u een auto nodig. Wij hebben een leuke vakantie gehad en hebben genoten van de tuin. Things to do in the area: Beaches, walking, Bus trips, Shopping, scuba diving, pedalos, jet ski's, horse riding, 4x4, quads, go karts, paintball, laser guns, hot air balloon rides, Water Parks, Theme park, safari parks, zoo's, fun fairs, Championship golf, crazy golf, Mud baths, Thermal water spa's, fresh water spa's, visits to museums, islands, castles, salt lakes and more. Why not combine your holiday with some RYA training: Campoamor Marina is very close and by has a RYA Sailing / Powerboat / Jet Ski School. www.nauticalcostablanca.com A little further there is RYA sailing school available in Torrevieja Marina. We understand you can also charter sailing from Cabo Roig harbour. 30-40 mins stroll to Cabo Roig beach with its Marina and beautiful views over the sea. Walk along palm lined avenues. All the beaches are Blue Flag some have bars on the beach. Cabo Roig, La Zenia, Playa Flamenca, Campoamor to name but a few. 30 mins drive North along the coast road N332 is Guardamar Beach which is lined with pines and sand dunes. 20 mins drive North is Torrivieja town & beach which has a street market and marina. 25 mins drive South is the up market Mar Menor & the La Manga strip, home to the stars. Pamper yourself with a beach massage or a mud bath at Lo Pagon. Alicante Airport in the North is 50 mins drive. NEW Murcia International Airport in the South is 50 mins drive. Public transport is available in all major towns. Car hire is available inside the airports or locally to the house if you wish to explore the area but all facilities are within walking distance. Bus stop by Aldi & are every hour to the beach & surrounding area. Taxi pickup and return can be organised and car hire is available on request (subject to availability) or there is a garage next to mini golf to hire from. Aqua parks, Theme parks within 1 hr drive. Benidorm approx 1.30 hrs drive. Castles, museums, mountains, lakes are all in 3 hrs drive. Cabo Roig town is 8km from Torrevieja which is a lively town with its sea front bars, restaurants, designer shops, marina & beaches. The Orihuela Costa resort hotel (10 minutes drive) allows non resident personnel use of its sports facilities and restaurant offering a selection of international cuisine. Airports are NEW Murcia International 50km or Alicante 50km. Markets are all around the area on different days of the week..
Beach and water activities 2km. The plaza (La Ronda square) is 5 mins walk away from the property which has garage, chinese warehouse, laundrette & new shopping complex opening soon includes restaurants with views over the nature area, supermarket & shops. The squares/area also have Spanish, Dutch English, Irish bars with internet/WiFi access, take away chip/donner kabab shop, Tapas bar, Bistro, Flower shop, Hairdressers, Tea house & Restaurants. A fashion warehouse is also opening shortly Also a mini golf diner is approx 10 mins walk away & a country style club called 'Eduardos Finca' which has swimming pool, BBQ & restaurant with al carte menu for anyone to use. Garage to hire cars is next door. You can find in the area water sports, snorkeling, diving, clubbing, walking, tennis, horse riding and cycling. Excellent Irish Bar with live music many nights (Paddy's Point) and a variety of dining opportunities. 25-30 minutes walk to the N332 coastal road is the Cabo Roig strip where ATM, pharmacy, banks, more bars & restaurants (Australian, Irish, Spanish, Mexican, Chinese buffet, Indian, Italian, Greek, English Sports Bar to name a few). There is also a go-cart track 5 mins drive towards Torrevieja. Three top golf courses within 15 mins drive including the famous Villa Martin with its famous square & Campoamor. The famous La Manga golf course a short drive away. A new Shopping Complex opened 2012 10 mins drive at La Zenia with 24,000sq mtrs, largest in Alicante includes stores: Zara, Leroy Merlin, Decathlon, Alcampo, H & M, C & A, Primark & many more also bars & restaurants open day & night, a large food court, Casino, Gym, Bowling alley, Relaxing area, Children's area, Large Plasma screen & car space for 5000. The salt lakes of Torrevieja has over 250 different species of birds and is also excellent medicine for arthritis, asthma and rheumatism sufferers. For Salsa dancers, Cabo Roig has its own Salsa bar owned and run by a native Spaniard, which offers lessons and dancing into the early hours. La Fuente & lively Villa Martin Plaza's are just a few minutes drive away with more shops, bars & restaurants, some nights live music. Booking Notes: 1-2 people can apply for cheaper rates please ask. Discount on 3 weeks or more. Pay key holder cleaning charge FROM 60 EURO- 100 EURO (DEPENDANT ON PARTY SIZE) when leaving the property & handing back the keys. Please leave house, kitchen appliances & barb e que clean, replace breakages as you will lose your deposit! No air con left on when out of property - you will lose your deposit! Thank you..